“The highest heavens belong to the Lord, but the earth he has given to man,” Psalm 115:16. The heavens or the spirit world, or the unseen world, are a restricted territory to us human beings. Our primary business is here on earth as the scripture above says. If the heavens were not so restricted to us we’d be able to see, hear and talk with the spiritual beings that exist in this spiritual world. These are God’s angels on one side and the fallen angels, including Satan, on the other side. It is therefore for a reason that the Lord closed our eyes, ears and other senses from having any contact with the spirit world. The main reason is that it’s his business to handle matters in the spirit world while it’s our business to focus on matters on earth. It may be easy for some to understand this distinction between the two realms. The Lord is keeping you from danger in a good way. 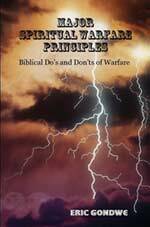 For some of us, understanding may have come through associating the avoidable experiences encountered in the years of active duty in the erroneous spiritual warfare and deliverance teachings. We’re able to see that certain types of “spiritual warfare prayers,” and “deliverance seminars,” are unscriptural and dangerous. Most of the erroneous spiritual warfare and deliverance teachings trespass into celestial (heavenly) realms that are outside our domain. Jackson says, “Only God has power to command his heavenly realms. Therefore, we who at present remain a little lower than the angels ought not to presume to command those spiritual beings who are higher ranking in the created order. This includes all of God’s heavenly hosts – Michael, Gabriel, or even any lesser angel. Remember, Gabrielle struck mute Zacharias, the high priest, because he spoke presumptively and simply questioned the angel (Luke 1:11-20). The bible says that destruction will come upon people who “speak abusively against whatever they do not understand.” It says, “These dreamers pollute their own bodies, reject authority and slander celestial beings. But even the archangel Michael, when he was disputing with the devil about the body of Moses, did not dare to bring a slanderous accusation against him, but said, “The Lord rebuke you!” Yet these men speak abusively against whatever they do not understand; and what things they do understand by instinct, like unreasoning animals--these are the very things that destroy them,” Jude 1:8-10. This sin may not take us to hell like the other “dreamers” being referred who also pollute themselves by pursuing evil desires. However it still brings destruction in our lives because we operate outside the will of God by trying to confront these celestial beings ourselves. God’s setup in his heavenly government is that he is the one to deal directly with the spiritual forces while we mind our business here on earth, living the Christian life. Scripture says these beings are higher ranking in the created order than we are. Yes they are fallen angels yet we are not, in this life, entitled to rule over them in their various ranks. Even the archangel Michael, in disputing with Satan about the body of Moses, had to follow protocols that God has set up. And we being “a little lower than the angels,” (Hebrews 2:7) deceive ourselves when we assume we can do otherwise –with serious consequences. Another similar scripture to the one given earlier from the book of Jude is in 2 Peter. It says, “Bold and arrogant, these men are not afraid to slander celestial beings; yet even angels, although they are stronger and more powerful, do not bring slanderous accusations against such beings in the presence of the Lord. But these men blaspheme in matters they do not understand. They are like brute beasts, creatures of instinct, born only to be caught and destroyed, and like beasts they too will perish,” 2 Peter 2:10-12. Satan’s territory is therefore outside our given realm of authority. Ours is on earth and only God has power and authority over the celestial beings in heavenly realms or the spirit world. Anything done outside our given realm of authority is, as the book of Jude says, considered rejection of authority. It is rejection of God’s authority on the limited spheres of influence he gave us. The kingdom of God is the only celestial (heavenly) realm we have access to. Our Lord Jesus even gave us the keys to God’s heavenly kingdom: “I will give you the keys of the kingdom of heaven; whatever you bind on earth will be bound in heaven, and whatever you loose on earth will be loosed in heaven,” Matthew 16:19. (On what binding and loosing means according to the bible, please read the previous chapter, Our Territory and Nature of Our Christian Authority. Some in the body of Christ recently began to assume it implied binding and loosing evil spirits in geographical territories, in the heavenly realms or the spirit world). “I will give you the keys of the kingdom of heaven,” Matthew 16:19. This means that there’re certain places and matters that unbelievers and Satan’s hosts cannot have access to in heaven. It’s our Father’s house that only his children have access to.